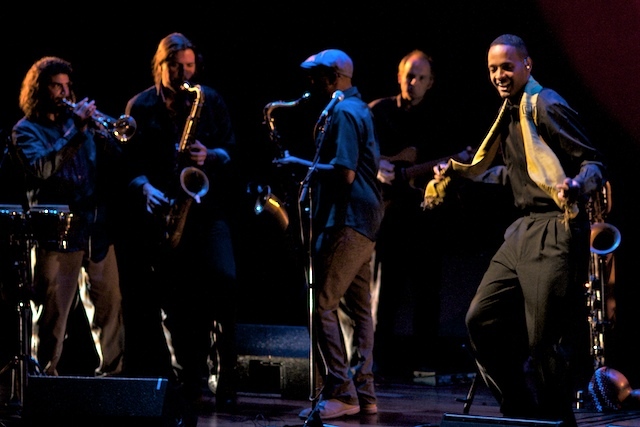 Danny Mekonnen is the founder of Debo Band, a remarkable 12-piece combo—virtually an orchestra—out of Boston. 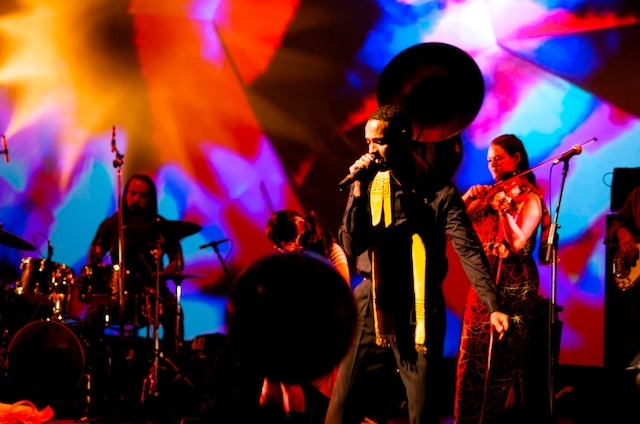 As Danny tells Afropop’s Banning Eyre in this interview, Debo Band draws from a wide range of folkloric, popular, classic and contemporary influences from Ethiopia, Danny’s ancestral home. Debo Band has just released a rich debut CD, Debo Band (Next Ambiance/Sub Pop), produced by Thomas “Tommy T” Gobena of Gogol Bordello fame. 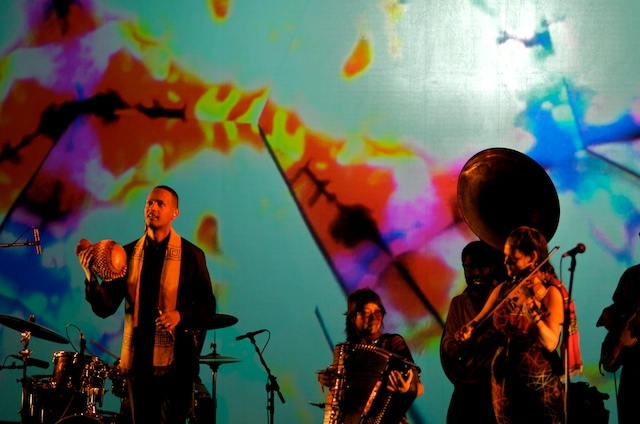 Banning Eyre caught up with Danny on September 17, 2012 at the Skirball Center in New York City, just before Debo played a double bill with Forro in the Dark as part of the Joshua Light Show—Joshua White’s retro-tech, liquid light and music spectacular. 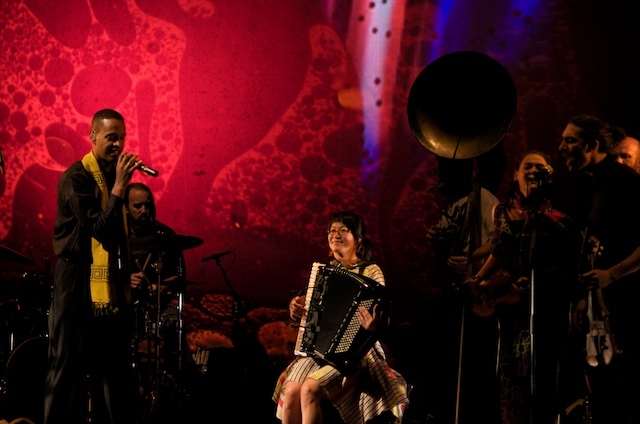 Danny said the musicians were warned that whatever they do on stage, they should not turn around and look at the projections while performing. Sitting in the audience, I could see why. 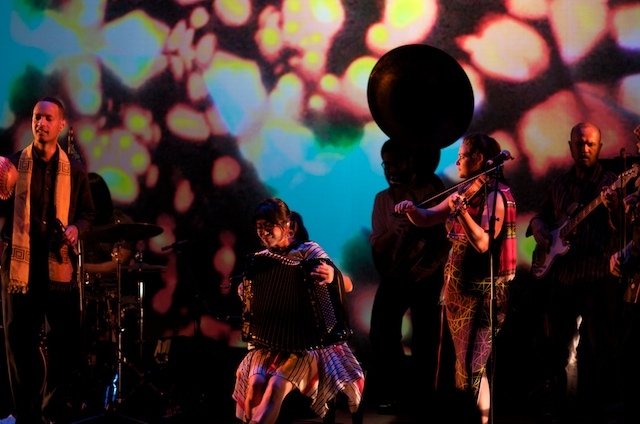 But checking out these photos while reading this interview should be quite safe … [caption id="attachment_5289" align="aligncenter" width="640" caption="Debo Band with Joshua Light Show (Eyre, 2012)"] [/caption] Banning Eyre: Tell the folks who you are. Danny Mekonnen: This is Danny from Debo Band. Happy to be here talking with Afropop. B.E. : We've been watching this amazing band develop, but this is the first time you and I have gotten to sit down for an interview. Let's start with a little bit about you. Give us your musical biography in brief. D.M. : In a nutshell, I’m Ethiopian American, born in Sudan, came to the states as a baby, 18 months old. I lived in a couple of small towns, Fargo, North Carolina, Paris, Texas. And I really felt rooted in the Dallas community. Dallas is one of the few big centers of Ethiopian American activity, a big population there. I had, you know, a typical middle school music education. I played the saxophone; I started in the sixth grade. And pretty early on, I was attracted to my parents’ music collection. Because I heard the horns and I was listening to jazz, so I felt connected to the brassy sounds I was hearing on those recordings. I had asked my father when he was returning to Ethiopia if he could pick up some sheet music for me. Of course, that was something that was not available in the 90s, and I don't think it's available today. You can't walk into a bookstore and get a chart for a Mulatu Astatke classic. So, in that sense, I wasn't trained enough as a musician in middle school to learn the music on my own. So for me, it took a jazz education. Having studied that in high school college and majored in jazz studies at the University of Texas in Arlington, I had acquired a sufficient degree of musical proficiency. And then, right around the time that I was transitioning from Texas to Boston, where I came to further my music studies [at Harvard], I got exposed to the Éthiopiques CD series. And that was really convenient, because all of those cassette tapes that I had listened to in that collection of music from the 70s was now all on my iPod, digitized and convenient. And that convenience became a conduit for my education about Ethiopian music. So that is sort of where my heritage, my background as an Ethiopian American, meets with my musical training. But then what really settled me into a band and a project was meeting a community of folks, Ethiopian Americans in Boston, and also American musicians who were playing all sorts of international music. Finding these two communities that were both interested in a project that I was leading, and then bringing the two together. 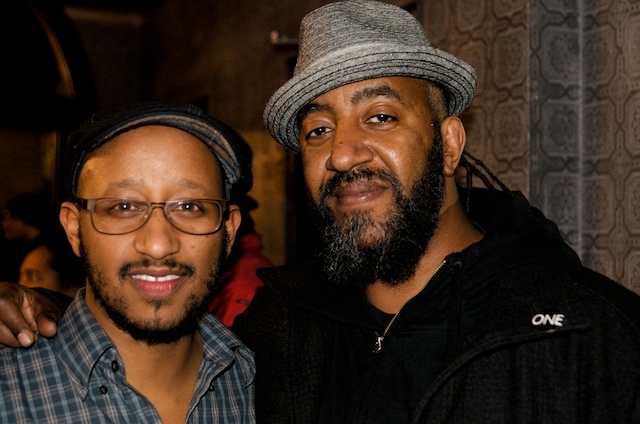 And there was our vocalist Bruck Tesfaye, who has been with us since the beginning, and other Ethiopian vocalists that we had early on from the Ethiopian community, and the core instrumentalists of the band who've been with me all along. B.E. : Very good. 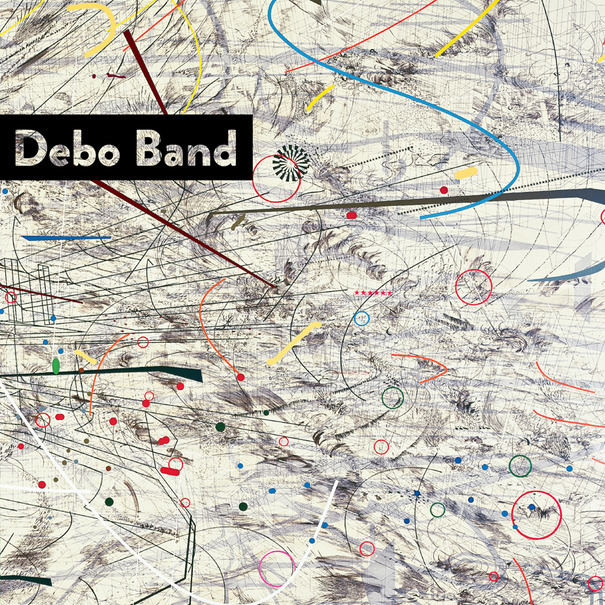 Let's jump into the contemporary state of Debo Band's music. You mentioned Mulatu and the whole Ethio-jazz movement, all important pre-history for what you're doing. 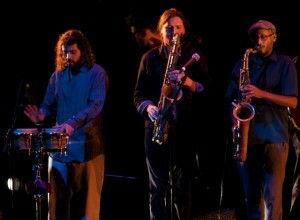 But you are also bringing in seasoned American jazz and rock musicians. And I wonder what are they bringing to Debo band's music that you wouldn't find in Mulatu's 1970s Ethio-jazz? D.M. : I think it's a different energy. It's not a sit down and have a cognac and listen to the music in a club, something like a smoky jazz club. It feels more like rock, a little bit more boasty, a little bit more punk, a little bit more breaking the rules. When I think of some of the groups that were real pioneers in this reemergence, this renaissance of Ethiopian jazz in the last decade or so in the States, Either Orchestra comes to mind. They really paved the way and opened a lot of doors. There were the first group in America that was doing these kinds of collaborations with people like Mulatu, and Mahmoud Ahmed and Alèmayèhu Eshèté. 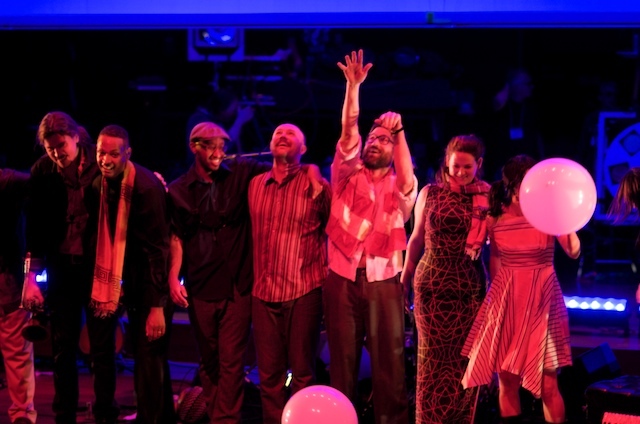 But I think where Debo Band comes at it differently is that we were really interested in the party or communal aspect of it, that kind of breaks free from the music stands, breaks free from the strictly voiced jazz harmonies that I think Mulatu was interested in. [caption id="attachment_5301" align="alignleft" width="300" caption="Mulatu Astatke (Eyre)"] [/caption] So if you look at some of the artists that were prolific in the 70s in Ethiopia, Mulatu was coming at the music from a jazz education background that he got at Berklee College of Music. I think there were younger musicians in Addis were modeling themselves more after artists like James Brown. There wasn't such a strong hard rock, Jimi Hendrix, psychedelic thing happening in Ethiopia. There were tinges of that. I think even in Mulatu's music you hear a little bit of that, some great wah-wah guitar happening. But I think there was a little bit more edge in some of the things. Like if you listen to Alèmayèhu's funk stuff, you hear him growling and things like that. Another thing I think is really significant is that there is more than one school of Ethiopian jazz. Mulatu sort of has the patent on Ethio-jazz, and he defined the sound for so many Westerners, let alone Ethiopians who really were attracted to that music. And I think he defined the era. 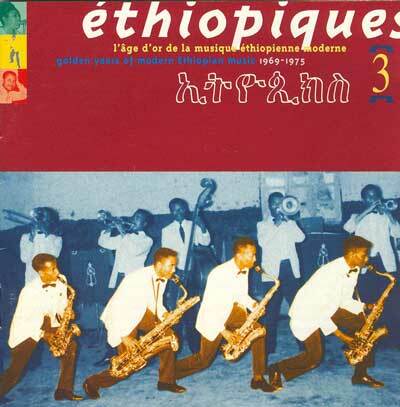 But there was another side of Ethiopian jazz that was more raw. The main proponent of that is someone like Getatchew Mekurya. Getatchew is this fierce, larger-than-life figure on the saxophone, a real virtuosi player. And when you hear that, it's not only virtuosity, but it's also this kind of visceral virtuosity. 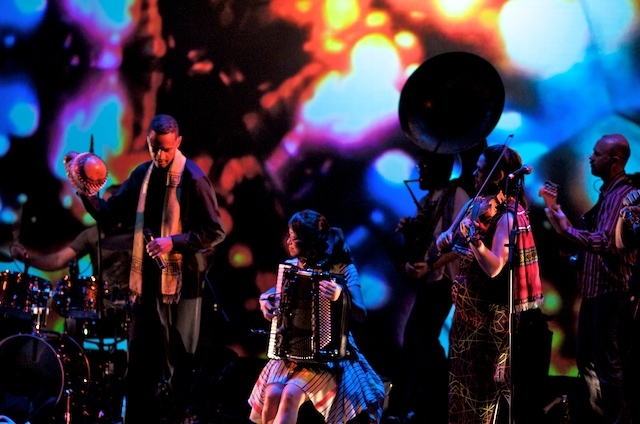 And if you listen to Mulatu, the words “virtuosity” and “visceral” don't really come to mind. It's a little bit more detached, cool, sophisticated, dapper -- all these things that Mulatu is when he walks into a room. You feel that. But I think that Getatchew is really a warrior. So I think Getatchew's collaboration with The X was like another inspiration for us, and hearing that punk jazz sort of vibe. And just to make this kind of crude spectrum of Getatchew on one side and Mulatu on the other... I mean, I think it's more complicated than that. B.E: But it's useful to establish those markers. 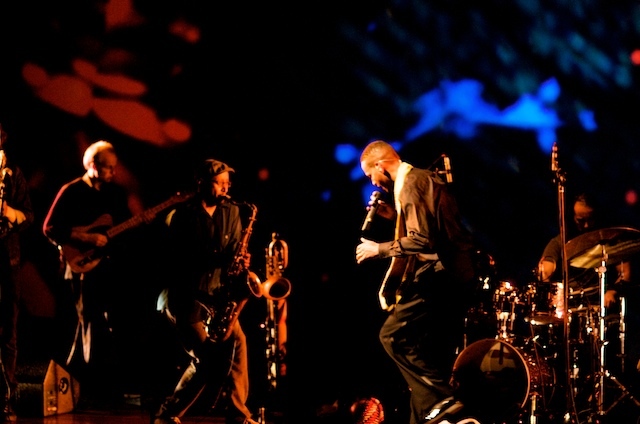 Getatchew's embrace by avant garde jazz musicians has always intrigued me. I mean, they are listening to him and hearing Albert Ayler, but he's really coming from a very different place, a place that has to do with Ethiopian traditional expression. It must've been quite an experience for him to be brought into these other musical worlds. D.M. : Yes, but to get back to your question of where our musicians are coming from, I think we are attracted to that rawness, that edge. And I think that a lot of us have backgrounds in rock music, punk music, experimental music, harder hitting jazz, avant-garde Jazz, which is something I was really into. So I think finding a place within Ethiopian jazz and funk for a little bit more of that edge, a little bit more of that party, a little bit more of that underground. When I think about the history of this band, to think that we were in "world music" project never even occurred to us for the first three or four years. Not until we started playing outside of Boston and playing festivals and playing at clubs where there had to be a label. Because, really, we were part of the Boston underground, which meant playing at loft parties and basement shows and playing on bills with weird hip-hop projects and bands that made their own instruments and all that sort of thing, which is the Boston underground. So that was really our way of approaching the underground through the Ethiopian music of the 70s. That was our inspiration. B.E. : Also in Boston, as you mentioned, the Either Orchestra has a great history of channeling and collaborating with artists from Ethiopian music. But other than that, you have to go back to the early 90s run of Aster Aweke to find much Ethiopian music on the American live scene. There were the Ethiopiques CDs, of course. 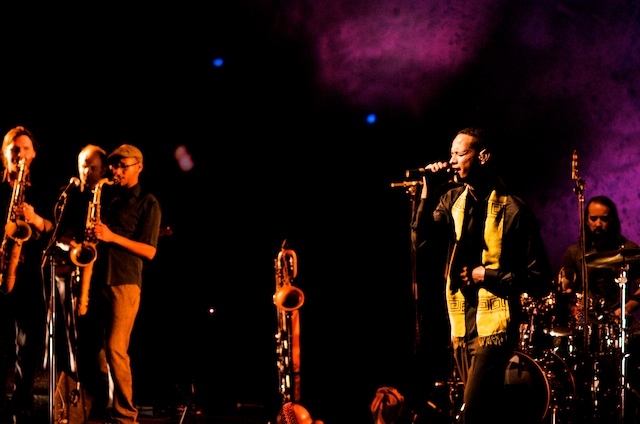 But very few groups have really played this music live on US stages, whether coming from Ethiopia or not. So I can see how there was an opening for this band. D.M. : Yeah. I certainly had a couple of years where I was wondering which part of this pond I wanted to jump in. And part of it for me was not picking one particular artist, though I mentioned Getatchew being a big inspiration early on. But the other thing was in the instrumentation taking certain historical cues, taking the fiddles which reference the one string fiddle, the masenko, taking the accordion which you find in lots of folk contexts in Ethiopia and bring it into the funk context. Taking the guitar, which was used for rhythm in Ethiopia, but not really the thrashing punk guitar. Our guitarist has a lot of that energy. And so to bring in the guitar, almost the metal side of that instrument, more to the forefront, and adding the low end of the sousaphone, which you don't find in any Ethiopian music that was recorded in the 70s. There is a brass band tradition that exists in Ethiopia with the reeds and the trumpets and trombones. But to take that low brass sound even further, the tessitura from the trombones to the sousaphone, and referencing the marching band thing that was happening. I mean, I never had one of these marching bands, but there are a lot of punk marching bands coming up in the last 10 years, everything from Muca Pazza to The Wacher Brigade out of Providence. And so we are influenced by that too. I was interested in sousaphone. So it's not only the artists and the genres within Ethiopian jazz that I think were important, but finding a way to have an instrumentation that referenced all these things that existed in Ethiopia but in a way that was unique to our project. B.E. : When I listen to Debo Band's brass, I sometimes think of Afrobeat, because the brass is a lot more aggressive than you find in most Ethiopian pop. Was that in any way an influence? D.M. : Not directly. But I did listen to Fela Kuti, and I was aware of that. 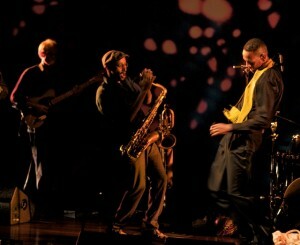 Our drummer had in Afrobeat band called The Super Powers, so that may come from his playing a bit too. B.E. : Let's talk about this CD. You had done some traveling and recording. You have some great adventures in Ethiopia. But this is the first time you all came together the studio to make a full-length CD. What were you trying to accomplish? D.M. : I think at that point, it's this kind of anxiety that a lot of musicians have when they go into the studio. How do we capture this thing that has existed live on the road and really soared in live concerts? That was one thing I was really wrapping my head around, because I didn't want to make a record that sounded like a studio record, or that sounded like a world music record, highly produced and carefully placed. We wanted it to feel more organic. And you also have 12 players on the record, 11 usually on tour with the band. So you've got 12 players. How do you make it orchestral? You know, sometimes in the live shows you don't hear all the nuances of the accordion or the violins. We have two violins, an electric one and an acoustic one. We want to hear all of that and make it rich and orchestral, but at the same time make it raw and live. So those two things were one idea. And the other thing was to pick some repertoire that highlights the different instruments. We wanted to give a full picture. Debo Band is writing original compositions, but there is traditional and folk material that we interpret, and that there are specific covers of original compositions that were written in the 70s by artists like Alèmayèhu Eshèté and Muleken Melèssé. I mean, you don't find covers by some of these artists because often there was just one side, one 45 of these songs, and these are songs that these artists hardly ever played live. So it's this idea of taking a very specific moment in time in 1972, taking this moment and saying, "Okay, there's this one artifact, this one gem of a song, and how do we create something new from it?" And then there's the folk material. I mean, there is an untold number of performances and recordings of the song "Akale Wube," the first track on our CD. So how can we reinvent that? 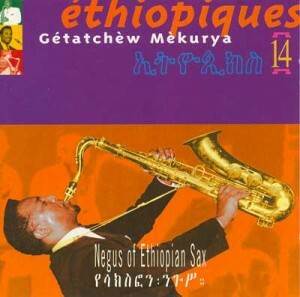 The version that we are drawing a lot of inspiration from is a Getatchew Mekuria recording that is fronted by two saxophones. So we adapted that for two fiddles. So it's really about painting a broad picture of the music that hopefully looks beyond this idea of the Golden age, which, if you look at it from 1968 to 1974, you know, it's just a few years. But if you were to look at one year in particular, like 1972, for example. At that time, you have Mulatu doing the cool Ethiopia jazz. You've got people like Alèmayèhu Eshèté singing funk, hard driving, imitating James Brown. You've got Mahmoud Ahmed and Imperial Bodyguard Band, very large ensembles. And you've got Buzen Eshfekela, the first lady of Ethiopian song, singing with these very sophisticated stage bands. Getatchew Mekuria doing his things. So all of these things are happening at the same time. And if you listen to the recordings, some of them may sound old, but there's this timeless element to it. There's so much happening and it's such a rich period. If you focus on one, you might think this is groovy funk music. If you focus on another, you might think that it's this rollicking traditional, even tribal kind of thing. 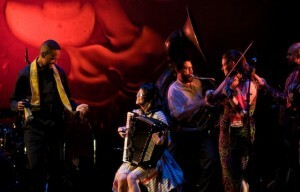 So we were trying to paint as rich a picture of the music as we could, which also leads into our original composition. So it's a lot of material to cover in a one-hour disc. B.E. : It is very rich. Let me ask you about a couple of specific songs. Tell me about one of the wedding songs. Your notes for the song "Ney Ney Weleba" comment on how the tonality sounds very dark to our ears, but it's actually a happy song. Talk about that paradox. D.M. : Yeah, well, I think that tonality and harmonic sense is a culturally specific thing. So something that may sound like a happy song to one group of people may sound like a sad song to another. And vice versa. You know, "Tizita," the song of nostalgia and melancholy is a major pentatonic scale. It's not too far from something like "Mary Had a Little Lamb." And that's one of the sadder songs. And this wedding song "Ney Ney Weleba" is this dark brooding diminished sounding thing, which feels really intense, like Danny Elfman movie music, just to broadly generalize. But it happens to be a wedding song, a celebratory song. I never really figured out how that tonality became one or the other, but I think that the energy behind the song is another thing. It's about the groom coming and being proud and brave, and taking the wife, and his wife preparing for the wedding and getting ready to dance and celebrate the preparations, braiding her hair. So this energy that people are responding to is oftentimes with a vocalist is singing about and speaking to. And the darker turn out of? Well, it just happens to be that way. You know, when I was studying music theory, I remember this conversation about one of the oddest times in music history, the 10th century, when they were trying to figure out how many notes to divide an octave into. And it just so happened that they arrived at eight. But you could divide an octave into any number of notes. It just so happened that we settled on this. Not to say that it's arbitrary, because there were lots of judgments that were made. But those are tonal decisions that take years and years to settle upon. 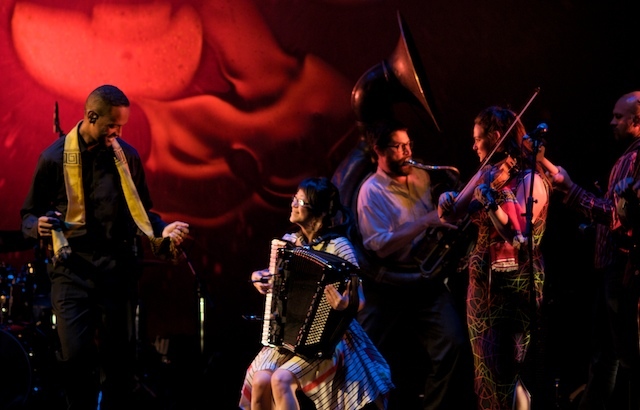 And in Ethiopia, it just happens to be a darker sounding scale, and that's the celebratory scale, and people respond to those notes and those harmonies and rhythms and these infectious dances, and this vibrancy that, if were lucky, we can translate in musical ways. [caption id="attachment_5326" align="alignleft" width="300" caption="Danny Mekonnen and Thomas "Tommy T" Gobena"] [/caption] B.E. : There's another paradox that has to do with the lyrics. That's this idea of "wax and gold," the profane and the sacred. Talk about that. D.M. : The wax and gold is something that you find mostly in traditional songs, folk songs. So a song that really depends that is "Medinanna Zelesegna." It's a song that has both secular and sacred passages. It's a praise song. It's this idea of presenting one lyric that has a surface meaning, but then there's a deeper poetic meaning beneath that. A lot of these songs have deeply personal lyrics. "Ambassel" is another folk song on the record. The melody comes from Mahmoud Ahmed, a song he recorded in the late 70s I think. But our vocalist Bruck Tesfaye wrote his own lyrics. Ambassel is a city in Ethiopia. So his lyrics talk about the city, they talk about yearning. So I think that is a bit more poetic and deals more with the personal or storytelling aspects of the music. But I think that that is one of these things that draws more on... I've talked a lot about the vibrancy, the vitality, the energy of the music, the things that you feel in the wedding songs, but there's also a deep spiritual thing, reflective, melancholy, introspective. And I think of this idea of wax and gold relates more to that kind of deep spiritual quality in the music. We were talking about what brought this record in fruition, and in a way, it's not only balancing different styles and periods of Ethiopian music, but also this balance of celebration and this deeply spiritual kind of heavy thing. Hopefully our record can feel fun and danceable and groovy, but also, there are some tracks that are a bit heavy, and they just make you think and feel. And both can be moving, right? B.E. : Absolutely. And that's a big part of what's so gripping about this music. By the way, what does “Debo” mean? D.M. : It means kind of collective, communal labor. B.E. : We've talked about a number of ways in which you have extended tradition, adding the edgy rock and party side to music that was more staid in its original form. 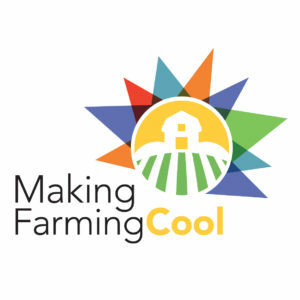 You're combining traditional and popular ideas. You're bringing in certain Western sensibilities and instrumentation. I think for me, who has listened to a lot of Ethiopian music, I can readily appreciate these innovations. But I think that some people mistakenly imagine that you're doing something that's very faithful to the original, that you're effectively a revival band. 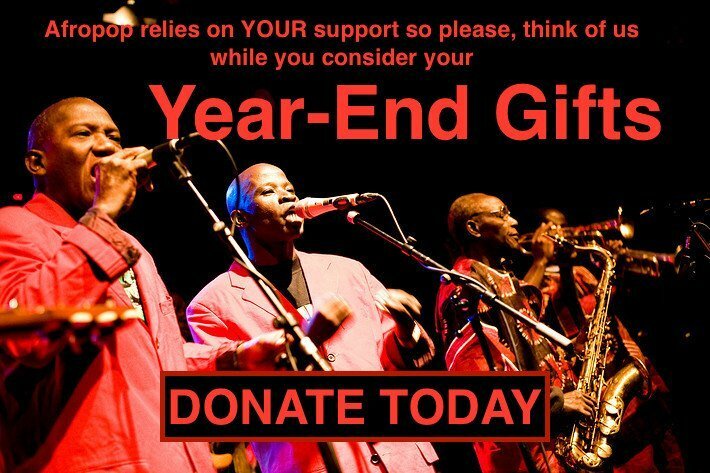 This is a problem that the Afrobeat bands sometimes deal with. Everyone loves that they're playing Afrobeat, but then critics start criticizing them for just playing Afrobeat. So my question is this. How do you balance the impulse to honor and channel traditions with the urge to innovate? I know it's a big question. D.M. : Yeah, it is a big question. And it's something that I've been thinking about since the beginning. How do you pay hommage to something but also give it a new life? And it seems a bit disingenuous to approach the music for its museum or archival quality. Because this is something that I care about too deeply to just try to re-create. With a lot of these songs, it wasn't just the music. There was a mood to the recordings. Part of that is the simple setup, sophisticated and big ensembles, but just a pair of mics, and how that gets captured. 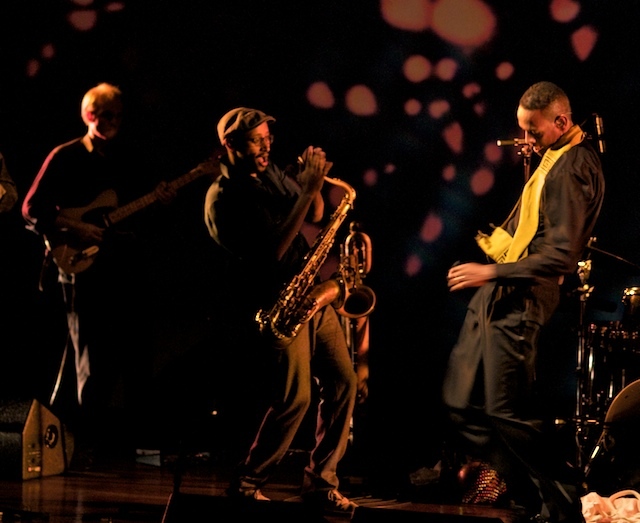 Because you can feel the room, and the performances are so strong, and the musicians are so innovative... I mean, how can you ever re-create a Mahmoud Ahmed song? You can't do it, and if you really care about that, you know that it's almost like sacred ground. But I think that the way that you move beyond that is to say that if you really care about something and you want to give it new life, you grip it, and you almost just rip it apart. You have studied it and you have delved so deeply into it. I mean, when I was a student of jazz and John Coltrane, there's no telling how many times I listened to "A Love Supreme." So the same kind of anxiety was there. You could never do another version of this, but you could take that energy and build from it. I still would never try to do the song "A Love Supreme." But you can take that five and do something new, and it may manifest itself, you know, the way Coltrane's "Interstellar Space" was redone by Nels Cline. Something like that. You can take it and take it in a new direction that is clearly understanding and having dug deeply into that music, but giving it its own life. It's almost like, don't touch it, because it's too important, it's too rich, too close to your heart. But giving it a new life means not being afraid to blow it apart, see all the pieces, and see [caption id="attachment_5311" align="alignright" width="300" caption="Debo Band at globalFEST 2012, Webster Hall (Eyre)"] [/caption] what's left. So this idea of a kind of violent embrace, just be in rapture of it, rip it apart, and find something new, it's been a real challenge. The other trick would be in listening to this and wondering about the revivalist thing. If you just close your eyes and listen to the album, and try to pick out the originals versus the covers, and to the goal would be that the two melds together. Some of this music is more contemporary, and some of its older. Some of its more traditional, and some of it comes from a very specific artist. But if you can kind of blur those lines between contemporary... I mean, these binaries of modern and traditional, as if they're opposed. Something can be both modern and traditional. And in a way, a lot of this is the kind of stuff that I picked up with artists like Mulaku Belaye, the dancer with Fendeka [a traditional ensemble that collaborated with Debo Band]. He's a folk dancer, but if you watch them, it feels like contemporary movement. So for me it goes back to this idea of not wanting to have a museum piece. Ethiopian music existed in the 1970s, and the 80s, and the 90s. It didn't die because of the coup. It changed. The final culture certainly went away, but there was a cheaper and also interesting Casio thing that happens too. There's a lot of unearthing that needs to be done. B.E. : That's true. About what came after the golden age. That is kind of hidden. D.M. : Yeah, the period after. It is hidden. You know, the pop that Aster Aweke and Gigi were making in the 90s and early 2000s is known, and then the so-called Golden age material in the 70s. But there's a lot of interesting things happening in between, in the 80s and 90s. You've got a bit of a shifting picture. So I look at Debo Band as part of a continuum of the last 40 or 50 years of Ethiopian music, not one that goes back to the 1970s. It was already there. I don't want to go back, even though there are strong influences. B.E. : Well said. You've taken this band Ethiopia. Once, twice? D.M. : Twice. B.E. : And you, how many times have you personally been to Ethiopia? D.M. : I've been to Ethiopia five times. I went when I was 12, then again in my early 20s, and then once on a graduate teaching program when I was at Harvard in the PhD program. And then twice with Debo. So a couple of times as an adult on my own, and a couple of times with Debo Band. B.E. : Good. So you have a few different markers. I'm interested in what your sense of the trajectory of the music scene is like over that period of time. Is it getting better? More bands? More interesting bands? D.M. : Yeah, I think that things are definitely moving forward in the right direction. More venues. More bands. 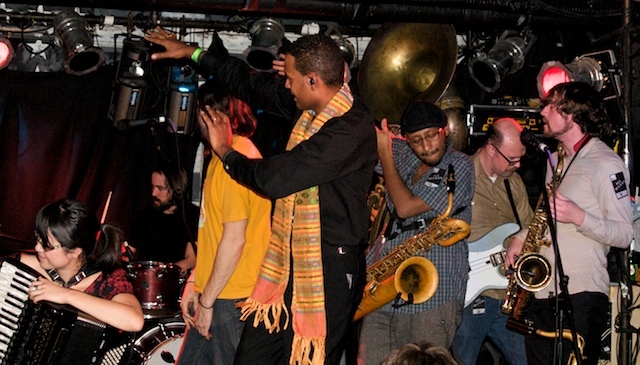 When I went to 2005, there were a handful of musicians, and a handful of jazz clubs. By 2007, there were some key figures of Ethiopian music would work with people like Gigi who had repatriated to Ethiopia. B.E. : Abegasu Shiota and Hennoch Temesgen. D.M. : Right. So when you have the leading producers and performers of Ethiopian music returning to Ethiopia… I mean, they wouldn't go back if they felt like their careers were best served in a place like Washington DC or New York. So I think it says a lot when you have the most prolific producer of Ethiopia from the last 30 years, Abegasu Shiota, living in Ethiopia. And then I think there are a lot of young people. 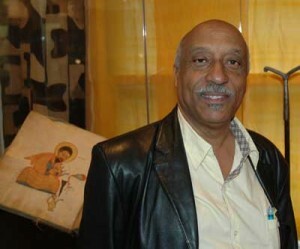 I mean, the success of the Ethiopiques series, and the revitalization of careers of artists like Mahmoud Ahmed and Alèmayèhu Eshèté through the exposure of that series, the cross collaborations, the bands that have been playing this music, that can't help but influence him local market, and strengthen that. Ethiopians are already a prideful group of people, proud of the fact that they have their own alphabet and their own calendar, and that they had only a brief and almost nonexistent occupation by the Italians. They are an independent country. So there's a lot of pride there. And it only took a little bit of nudging and realization to see that there's a larger appeal there. But the music, the traditional music, the folk music, the kind of thing that you hear in the countryside and even some of these music houses, these azmaribets throughout Addis Ababa, they were vibrant. I remember being in those when I was 12 years old, and hearing that. So the music never really went away. I don't want to be too critical of this idea of the Golden age. I understand that you lost instrumentalists, and you lost some of that vibrancy in Addis Ababa. But in the last 10 years, what I've seen is that it's really picked up, and there are more and more and more bands, and so many venues. And Addis Ababa, it's a vibrant city. It has always been. I think now with the repatriation of musicians, and also other businesspeople, I think there is more wealth in the city. There's a little bit more disposable income for things like music. So every time I go back, it seems to be getting better.' There are some very young musicians, like the piano player, Samuel Yirga, this brilliant piano prodigy who was working with Dub Colossus, and ended up on Real World Records, Peter Gabriel's label. He has an album that coincidentally came out on the same day in the UK as our album. I think it's called Guzo. He's a brilliant jazz pianist, and he’s 25 years old. So talk about Ethiopian jazz and that sort of continuing of instrumental tradition that people like Mulato created in the 70s. He's taking it in a completely different direction. B.E. : I used to go and see Ethiopian music in Washington DC, and I heard some amazing singers. But it was always a keyboard a bass player a saxophonist a singer. There was never a real band. It was often very exciting, but there was something missing in terms of the dynamics of a band. Is that gone? D.M. : The short answer is definitely the bands are coming back. And you know, part of that is through the benefits of some really great music education programs in Ethiopia. The Yared School of Music is the oldest school of music in Ethiopia, affiliated with Addis Ababa University. There are also some private jazz schools. We talked about Abegasu and Hennoch. They have their own jazz school called the African Jazz School. And Mulatu has a school that he started in the last year or two. B.E. : Yes. We have a short video about Mulatu’s school on our website. D.M. : So there are programs. 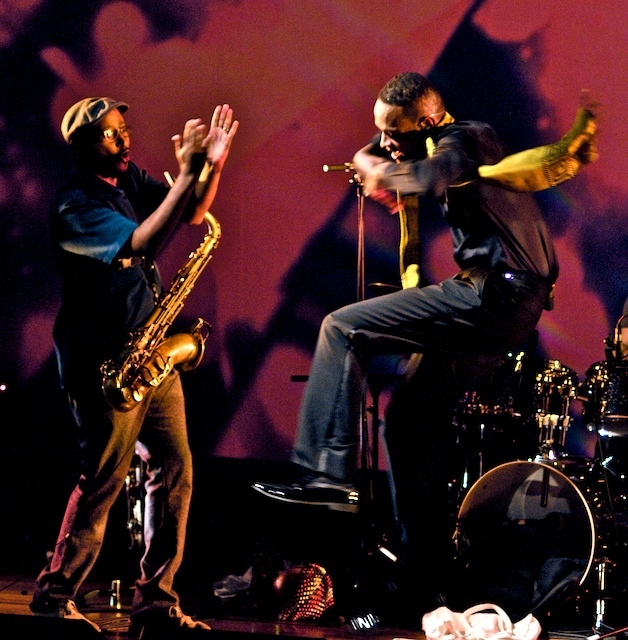 The X has done a five-part residency program going to Ethiopia, bringing interesting experimental music projects from Europe to Ethiopia, and doing these workshops. It is really picking up. It's kind of hard to keep up with all the artists and bands that are emerging. I mean, you still hear the keyboard and that sort of wallpaper restaurant lounge music that is almost easy to ignore. But I think the bands are certainly coming back. And there is something else about the Golden age still being remembered. We played recently for the first time in Toronto, and we were performing a song that's on this record called "Yefeker Wagagene." And you see a lady in the audience singing this song. She was in her 60s. I don't know if she's ever heard this song performed before. You know? And I don't know the last time she'd even listen to a recording of it. But these songs are really remembered by people. Not only that generation, but people my age and younger. It isn't like this disassociation you might have by someone in your 30s today and how they might feel about Fleetwood Mac. It isn't, "Oh, that's my parents music." There's a sense in which it's our music, and it's still vibrant. Most young people in Ethiopia still know all the lyrics to Mahmoud Ahmed's big songs. So it isn't our grandparents’ generations music, because it's a more homogenous musical landscape. Every decade has a new revolution, whether it be hip hop or punk or whatever. So if your listing to the Beastie Boys, it's a little hard to appreciate your parents Fleetwood Mac collection. But you don't find that separation in Ethiopia. B.E. : I think that separation was even more pronounced in earlier generations here. Americans who grew up with rock in the 60s and 70s had parents who listened to Glenn Miller and show tunes. That was truly a world apart. D.M. : Right. B.E. : It’s not like that for today’s Ethiopian kids. D.M. : No, not at all. B.E. : So it sounds like we have reason to expect a lot of great music out of Ethiopia in the future. D.M. : Yes. 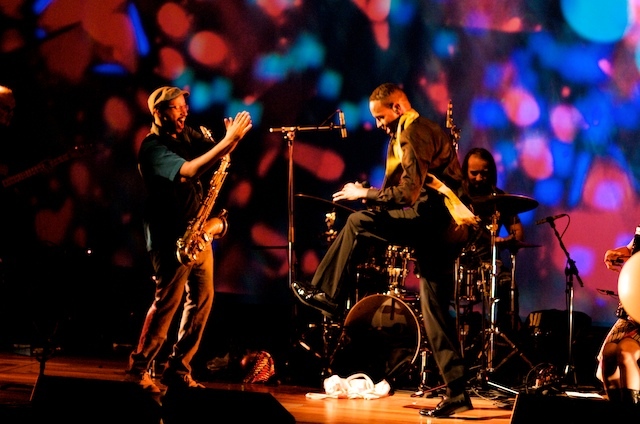 And if Debo Band can return and play and to participate in that revitalization of the Addis Ababa musical environment, we are thrilled for that. 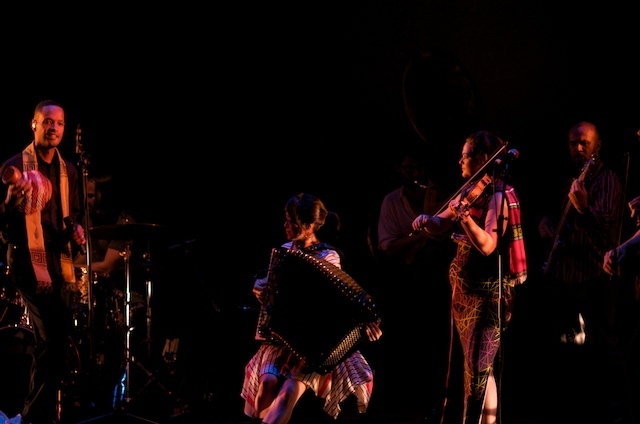 A couple of the tours that we made there, and our collaborations with Fendeka, these really great traditional musicians and dancers we worked with, is a start. And it's a big country. We've only been to Addis and a couple of other cities. I would love to return with the band and travel on our own, taking a generator and playing a bunch of schools, and just playing for people—this idea of sharing. Yeah, there are Americans in the band. It's a bit unusual for outsiders to play Ethiopian music. That's still a pretty new thing there. B.E. : But the country has a huge diaspora, and this is also a way to connect back with that. D.M. : Right, yeah. There are lots of big cities in North America, and every time we go to one, we've got this Ethiopian crowd that comes out of knows the music. B.E. : That must be fun. D.M. : It's a blast. B.E. : Great. I want to get ready for the show now. But thanks so much for talking. D.M. : Thank you.